Sharp pains in the chest can be caused by a serious condition so it's important to see a doctor soon to help determine the cause and seek proper treatment. When people start to feel a sharp pain in the chest, this can be cause for alarm as this side effect is often associated with heart trouble. If you have been experiencing a sharp pain in the chest, it's important to evaluate your symptoms to quickly determine whether or not you require medical attention right away or if there are other steps you should take to relieve your discomfort. What May Cause Sharp Pain in Chest? Sharp pain in the chest can be very afflictive. As for its cause, many people may first come up with the heart related diseases. However, there are also other physical illnesses which may trigger this condition. In many cases, a sharp pain in the chest is related to heart trouble. This can be caused by pericarditis, which is inflammation of the sac that surrounds the heart. In most cases this is caused by a viral infection in the chest and is often short lived. Chest pain can also be caused by an aortic dissection, which is when the inner layers of the aorta separate. This will result in blood becoming trapped between these layers, which can result in the aorta bursting. 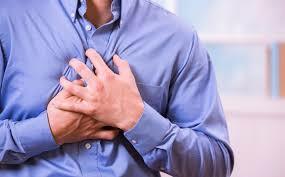 Angina can also lead to chronic sharp pains in the chest. Angina is caused when plaque builds up on the walls of the arteries, making it difficult for the heart to pump blood as effectively. This can lead to sharp pains in the chest after physical activity because the heart is having difficulty beating at this increased level. A sharp pain in chest can be caused by a heart attack, or a clot that is blocking the blood flow to the heart. This pain will feel more like tightness in the chest which can continue to spread through the arms and back as it becomes more severe. This pain will often come on suddenly and can be paired with nausea, dizziness or a sudden weakness. Digestive trouble can also lead to sharp pains in the chest that can be mistaken for heart trouble. One of the most common issues that can lead to this discomfort is heartburn. This pain can feel like a burning sensation that rests just below the breastbone. This is caused by stomach acid escaping into the esophagus and burning the tissue here. If you notice that the sharp pain in your chest tends to appear when you swallow, then it may be caused by damage to the esophagus. When the esophagus is damaged or is suffering from a disorder, then it can become very painful to swallow. Sharp pains in the chest while eating can also be the result of your gallbladder or pancreas malfunctioning. This can be a sign that your body is not breaking down food properly. A swollen gallbladder can also lead to a sharp pain in the chest that can be quite uncomfortable. Lung trouble can also cause the body to feel sharp pain in chest. This can be caused by pleurisy, a condition that causes the lungs to become inflamed. You will most likely notice this pain when you cough. This can also be the result of pulmonary hypertension, which causes the arteries responsible for carrying blood to the lungs developing high blood pressure. Similarly, pulmonary embolism, or a blood clot forming in the arteries bringing blood to the lungs, can cause a sharp pain in the chest to appear. In serious cases, a collapsed lung can be the result of your chest pain. This is caused by air leaking between your lung and ribcage, and the pain from this condition can last for hours at a time. You may also be suffering from costochondritis, a condition that causes the cartilage in your rib cage to become inflamed. When you breathe or take part in physical activities, this condition can lead to a sharp pain in the chest. Shingles can also lead to sharp pains in the chest as the blisters begin to form on the chest wall. Less severe causes of sharp pains in the chest include sore or damaged muscles and ribs in the chest. Panic attacks can also lead to chest pain as your heartbeat and breathing rate increases. Panic attacks are often accompanied by sweating, shortness of breath or an overwhelming sense of fear. Here are some tips that offer you with several helpful methods to deal with pain in chest, involving medical treatment and home care. Because many causes of chest pain are serious medical conditions, it's important to have your condition checked out by a doctor. If you are overweight, smoke, use illegal drugs such as cocaine, suffer from high cholesterol, high blood pressure, diabetes or you have a family history of heart disease, it's important to see your doctor as soon as possible to determine the root cause of your discomfort. It's also important to see your doctor right away, if your chest pain has lasted for more than 3-5 days, you are having difficulty swallowing, you are coughing up yellow-green phlegm, you have a fever, or your chest pain is very severe. If your chest pain is accompanied by a tightening in the chest, dizziness, nausea, sweating, sudden sharp pain after stretching, you have angina and your pain suddenly becomes worse or the pain begins to spread through the body including spreading to the jaw or between the shoulder blades, then you should call for emergency medical services immediately. Once your doctor has helped you narrow down the cause of your chest pain, there are a number of home treatments you can implement in addition to any medication you have been prescribed to help eliminate your discomfort. Your doctor may recommend changes in your diet or an increase in your physical activity to help get your body back into working order.